Picture from simon3 : Descending into the mountain. Picture: Descending into the mountain. There is a superb feature to be explored near King's Mountain, just 700m SE of it in fact, across the Kings Gully. Technically this is on a spur of Slievemore rather than King's Mountain. 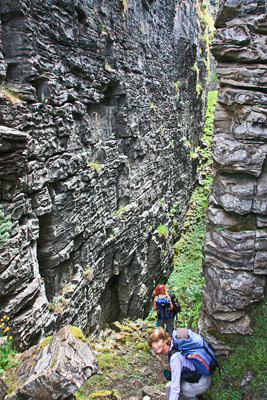 The feature is a long (300m+) SE split in the rock which you can walk down at around G7083 4368 F. In itself this is really extraordinary, with two parallel walls each with near horizontal bedding planes, covered in places with vegetation. It's hard to think of anywhere else on the island with a feature like this. After about 125m you come to a place where the ground drops quickly perhaps 15 or 20m. From then on it is strictly climbing country - do not attempt without climbing experience and gear. If you do have the gear for abseiling there is a series of serious spikes driven into the rock at this point to assist you. There is only one such really steep piece so if you can't go down this cliff you can get to the bottom of it from the other end of the split in the rock. Eventually after a number of further climbs and descents the split ends and you emerge on the hillside, altogether about 300m SE of the start. This feature is well worth exploring whether or not you are equipped to do the abseil.